Amateur Contact Log 5.9 & CQ WPX 4.2 Are Now Available! Amateur Contact Log 5.9 is Now Available! The above will display for many of the fields including states, grids, etc. - Addition of the free Callook call book lookup service (only includes USA call signs). Remember to be sure to only use one call book data source at a time. As always, upgrades are free to registered users! You'll find Amateur Contact Log 5.9 here. 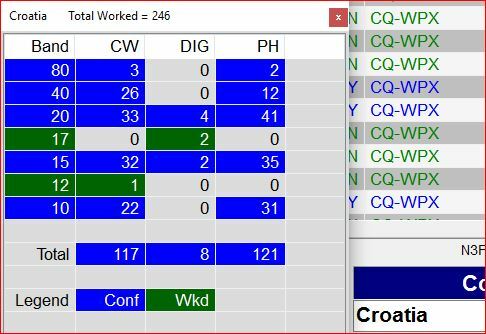 CQ WPX Contest Log 4.2 Now Available! We are always looking for ways to increase our contest QSO rates! During ARRL International DX SSB, working mostly Click & Pounce in the Assisted category, I realized that there was an opportunity for an efficiency enhancement with the band map. I use the Band Map as a check list, working each station that I can, right clicking to clear it afterwards (or if I don't hear him / can't get him) and then moving on to the next station. That requires a mouse grab and two mouse clicks. It only takes a second or two, but that's often just long enough to miss the call sign of the next CQing station, requiring the need to wait for him to call again, or listen while he works someone else first. I realized how cool it would be to immediately jump to the next station the moment we press enter! CQ WPX version 4.2 allows us to do just that! With rig interface enabled, as soon as we log the previous contact, 4.2 will automatically remove the spot we just worked from our Band Map (if we have Block Duplicates selected on the DX Spotting Filter form), tune our rigs to the next spot and fill the Call field for us, all without requiring a mouse grab! Ctrl + Shift + E Toggles the jump to next spot option. Ctrl + Shift + Z Jumps to the next spot in the band map. Some other beta testers and I tried this new code during CQ WPX SSB and it is definitely a QSO rate enhancer! Just remember to turn it off before you call CQ yourself! - Option to automatically spot DX on entry (enable by pressing Ctrl + Shift + T). Lord willing, I plan to have these enhancements added to the rest of the contest software well before the fall contest season begins! Is Field Day Contest Log Version 5.4 the Latest? Lots of folks are getting set for Field Day, installing software and e-mailing to see if I have any Field Day software revisions planned between now and Field Day. I am not planning any new releases to the Field Day software before this year's event. Version 5.4, released in January should be it, so go ahead and install it! By the way, it is excellent that so many of you are getting set this far in advance!